Do you have a passion for financial education? Do you get what we call “goose pimples” when you know you’ve just done something good for someone? Imagine wanting to change the way kids and teens learn about money in the world but you realize that in order to accomplish your monumental goal, you must have help from other like-minded people. This is where you come in. Do you have a passion for Financial Literacy Education? Do you love watching kids, teens and adults learn the lessons that most of us adults never learned? Do you want to help Creative Wealth put effective, fun and powerful financial education all over the US and world? Do you know your community, able to help find great locations, round up local volunteers for marketing help and assistance during camps, help secure scholarship funds, promote camps, connect with local media, etc.? Do you have leadership skills in order to help recruit, train, motivate, direct and celebrate with your band of merry volunteers? Would you like to be rewarded for your time with a thank you check from each camp you help with? Do you want to learn how to put on your own camps and perhaps license your area for the following year? Would you enjoy being coached by the best instructors at Creative Wealth? Would you like to be recognized as the Financial Literacy Representative in the area? You’ll become the financial literacy expert people call in your area? You’ll be featured on the CWI website as one of our highly valued Ambassadors. Leave a legacy of setting up a generation of kids to be financially savvy? You can literally be the link or bridge for kids and teens from an unconscious way of being with money which was handed down to them from their families and society to being adults with a financial self-awareness that allows him/her to deliberately create their lives the way they want to, which includes being a huge contribution to the world. No one is loved and appreciated and remembered more than a teacher who changes a child’s life. Participate in Creative Wealth’s mission to take kids from the hardships of that they are being indoctrinated into filled with stress, debt, pressure from creditors and lack of freedom (predictable quagmire) to a life where these children grow into the type of people who deliberately and powerfully call the shots in their lives, i.e., win their own personal money game. So…if you like to have fun, like to work with kids/teens, like to be part of something bigger, like to spread an amazing message…then we want you! Find local sources of scholarship funds and marketing sponsorships. Be acknowledged during camp for all your dedication and hard work. If this is you, please complete this short application and send it in. We’ll be in touch quickly to set up your Ambassador interview. We can’t wait to hear from you! Hold down Command key to select multiple entries. 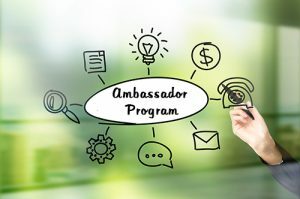 Why do you want to be an Ambassador in your area? How would you feel, knowing you've set kids on a great path?